Apple does not waver in the enforcement of its patents against Android device makers. On Monday (June 4), Apple filed a new complaint against HTC with the United States International Trade Commission ("ITC"). The ITC is a quasi-judicial U.S. government agency that has the authority to impose import bans against infringing goods. Apple asserted 10 patents in its ITC complaint (and 10 in a Delaware lawsuit). By the time an Administrative Law Judge (ALJ) made his initial determination, Apple had dropped six of the ten patents. 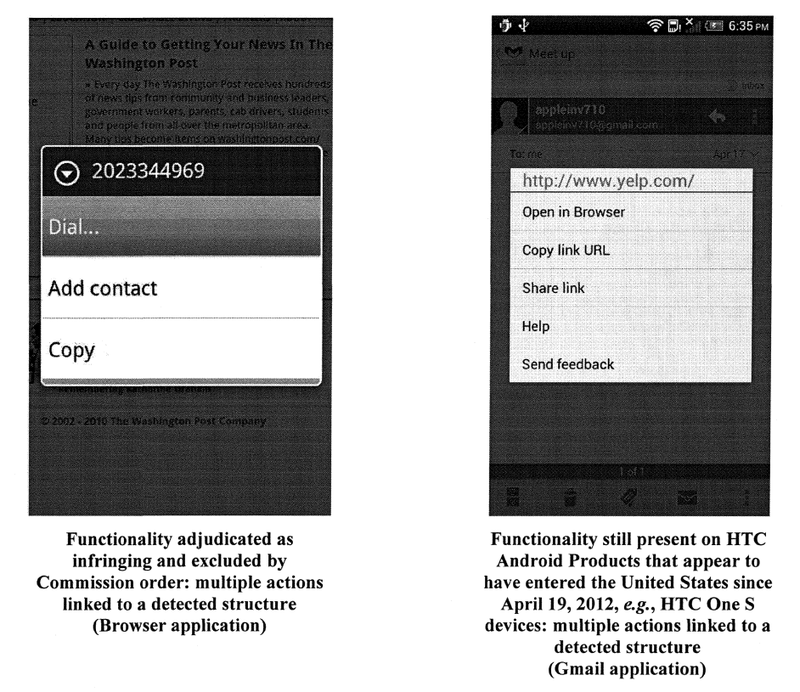 In July 2011, the ALJ found HTC to infringe two of them. But the Commission, the six-member decision-making body at the top of the ITC, adopted only one of the two infringement findings in its final decision in December 2011: the one relating to the '647 "data tapping" patent. Apple subsequently appealed to the Federal Circuit the parts of the ITC ruling that didn't work out in its favor. On July 8, 2011, Apple brought a second ITC complaint against HTC. That case currently has a trial date of November 7, 2012, and a target date for the final decision of March 7, 2013. It's important to know that the "data tapping" patent covers the inner workings that enable this feature, as opposed to the feature itself. Last year I published a table ("claim chart") showing the specific infringement allegations Apple brought against HTC over this patent back in 2010. You can see that the patent covers certain operations on data structures as opposed to a user interface element per se. In other words, there can be a genuine dispute over whether HTC's new implementation of the feature still falls within the scope of the patent. HTC apparently believes that it doesn't, while Apple believes that it does. The ITC will now have to evaluate the technology found in HTC's current products. The "data tapping" patent will go to trial in Chicago next week in an Apple v. Motorola action. Motorola tried to have the patent declared invalid and to be cleared of infringement, but Judge Posner determined that the patent may be valid and infringed. In March, Apple added HTC as a counterclaim-defendant to a litigation with Motorola in the Southern District of Florida. In that litigation, Motorola is asserting 12 patents against Apple, Apple is asserting 12 against Motorola, and HTC has to defend itself against 6 of the 12 patents Motorola has to deal with. The case currently has a 2014 trial date, much to Motorola's chagrin since this delays the adjudication of certain claims Motorola brought in October 2010. Also, Apple recently tried to assert four patents in a Delaware lawsuit that HTC started last summer, but the court disallowed those assertions because they were belated. The Delaware-based court recently ordered Apple and HTC to meet for court-moderated settlement talks. The meeting was originally scheduled for August 28 and has meanwhile been pushed back to September 19. Apple is also suing HTC in two German courts (I attended a Munich hearing and a Mannheim trial, which resulted in a stay). Last year, HTC brought defensive actions against Apple in the UK.